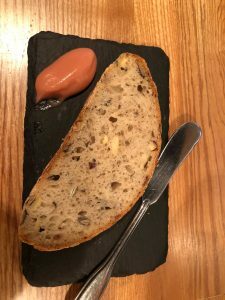 As we began to gather for our festive evening, the first pour of our beverage flight was paired with a slice of Farm Spirit’s walnut/Pepita bread coupled with a smoky quince paste. It was a preview of what was yet to come. A triad presented on a white rectangular plate with nests for each amuse-bousche. 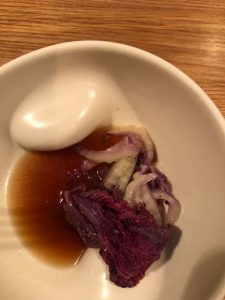 Celeriac was jerkied until pleasantly chewy yet not tough, which was accompanied by a quenelle-shaped horseradish cream. In the middle was a tortilla; however, it was not made with corn but rather with filberts prepared using a rather interesting process. 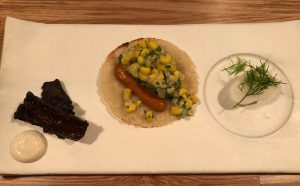 Nixtamalized (usually maize, soaked and then cooked in an alkaline solution, usually lime) filberts ground and turned into tortillas was the vessel for sweet corn and a pasilla pepper cream. Rounding out our trilogy was a poached turnip simply yet elegantly garnished with a sprig of dill. 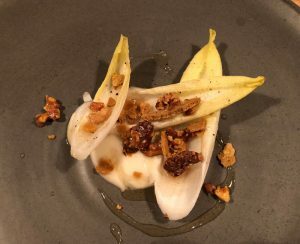 After amazing and bold flavors that were the springboard for the evening, we were delighted with a light yet flavorfully varied salad of endive and toasted walnuts seated on a dollop of chamomile and preserved lemon syrup. Light, refreshing, each component complementing the others. 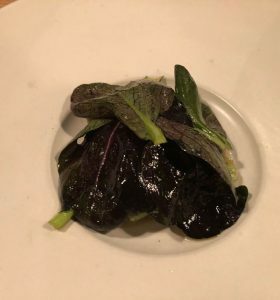 I was introduced to an unfamiliar type of leafy cabbage for this course. 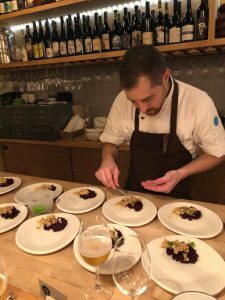 Tatsoi, a glossy green small-leafed cabbage from Asia tossed with a Pinot Noir vinegar and fermented serranos was the main star of the dish. However, nestled underneath the layers of tender Tatsoi was a hidden treasure of tatsoi, chanterelle mushrooms, and young ginger aromatically scented with tarragon. Although every single course was absolutely delicious and flawless, I’d have to say that if I were asked which was my favorite course, this was it. It reminded me of an upscale reuben in a bowl, a pinch bowl. Okay, I have to admit that I didn’t know what a pinch bowl was until Mia explained that it is exactly as it appears. The indent is where you would put your thumb so that you can easily raise the bowl to your lips and mannerly sip the broth. Red napa cabbage was prepared three ways; (1) fermented, (2) sautéed ribs, and (3) blanched leaves. A smoked kohlrabi broth lightly seasoned with mustard danced around the napa cabbage. This dish completely WOW’ed me! 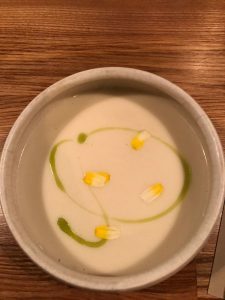 Velvety smooth sunchoke soup was sweet with a gentle touch of earthy smokiness. A drizzle of ginger leaf oil presented a colorful contrast and bold flavor to the elegant soup. It was garnished with a sprinkling of chrysanthemum leaves. This dish represented my only critique, and it had nothing whatsoever to do with the offerings themselves. I think the soup would have presented better in a colorful bowl. It sort of got lost in the white bowl…but where it only vaguely lacked in presentation it surely made up for it in its savory delectableness. Spaghetti squashed was tossed with a vegetable cream made with scallions, toasted cauliflower mushrooms, and habanada peppers (Habanero peppers that have had the heat bred out of them). I never knew that a habanada pepper existed. 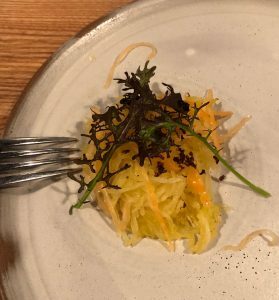 It was absolutely exquisite; and given the subtle flavor of the spaghetti squash, the vegetable cream exploded on my palate without any spicy heat. There were no limits to Farm Spirit’s attention to detail. This course, as with all of the others, had an array of steps to bring it to fruition. 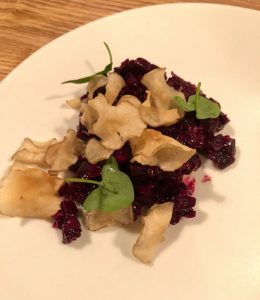 Red beets were dehydrated then reconstituted with a black garlic and smoked beet puree with pickled shallots and mustard seeds. The smokiness exuding from the beets somehow brought me to sitting in front of a yule log fire. 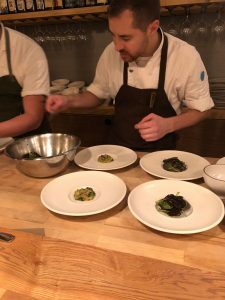 The garnish of fried sunchokes and sorrel added a textural complexity to this dish that elevated it to new heights in the culinary world. Our eighth and final savory course had a main and a side component. 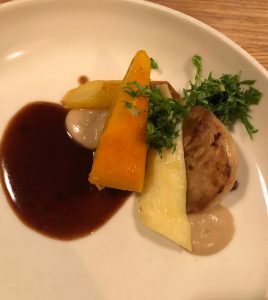 A medley of roasted squash, parsnips, carrots, and celeriac above a puddle of a charred vegetable reduction made from the day’s veggie scraps that are charred and then made into a broth reduction. A grilled onion puree added that extra punch to this dish. 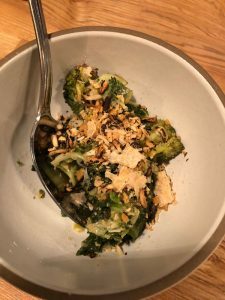 Alongside, but definitely not to be confused with a subservient side, was a bowl of roasted mizuna, which is a sort of Japanese mustard green. 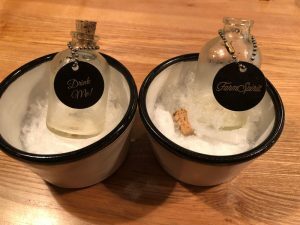 To cleanse our palate and prepare us for the movement from savory to sweet, we were served a shot-sized bottle of kefir in a bed of crushed ice. The perfect intermezzo, light, slightly sweet and gently pungent. It not only cleansed our palates but also refreshed them for the final, unexpected and sweet course. 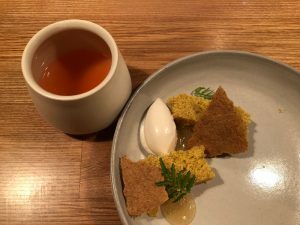 The dessert course consisted of two separate dishes with an herbal tea steeped with apples and geranium. 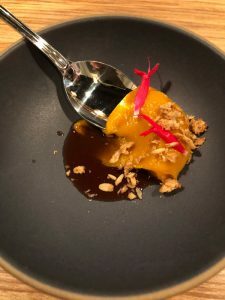 The first dish was a fresh dug sweet potato puree with a mountain rose apple syrup garnished with a splash of granola and an edible flower garnish. I was immediately taken back to my childhood and my favorite candy, a Mary Jane, which was molasses-flavored taffy with a smidge of peanut butter tucked inside. I didn’t want this dessert to end, so I took the smallest of bites to make it last longer. The final offering of the evening was a slightly sweet corn cake made with the inclusion of candy caps, a very small mushroom that is sometimes used to flavor a dessert. Tangerine jam sat dolloped alongside the cake with a scoop of smoked hazelnut milk lightly frozen. Edible marigold leaves make this dish a crowning glory. 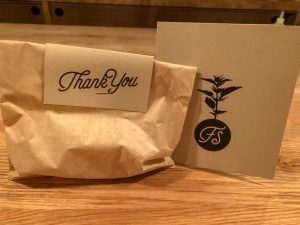 Not to leave empty-handed, we were each given a gift bag of banana bread as we left, fully sated, joyful, and all expressing that this has now become the barometer to which every other meal will now be compared.